Zimbabwe police issue stern warning against criminals - SABC News - Breaking news, special reports, world, business, sport coverage of all South African current events. Africa's news leader. The defence force and police are working together to try and quell the unrest, with rumours that another stay away is imminent in Zimbabwe. Zimbabwean police have issued a stern warning to act against anyone committing crimes while wearing military or police uniforms. There’s been looting since the protests turned violent last week. The defence force and police are working together to try and quell the unrest, with rumours that another stay away is imminent. We spoke to Zimbabwean nationals living in South Africa about the situation back home. A married couple from Zimbabwe has called South Africa their home for over a decade. For obvious reasons their identity has been concealed. The couple has roots in Zimbabwe and their children are still back home. They last had contact with their loved ones earlier this week. For many families in living in South Africa, it’s been an agonising few days. Innocent Nhlema has lived in South Africa for eight years. Nhlema is an economic migrant, sending money home monthly. 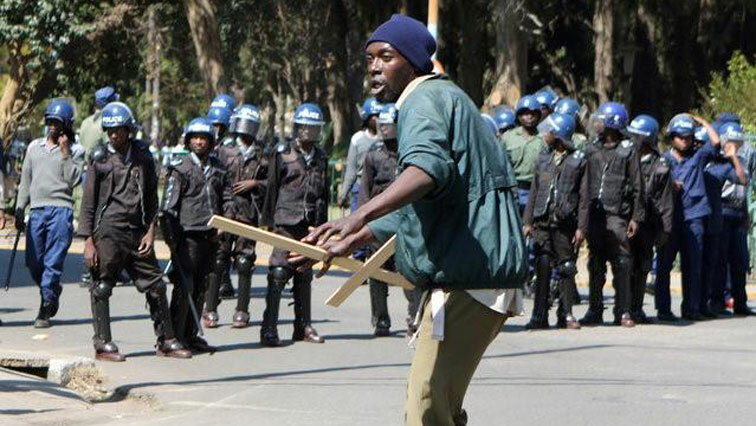 A second wave of unrest looms in Zimbabwe. Meanwhile, the African National Congress (ANC) has been in on-going talks with the Zimbabwe government. This entry was posted on 20 Jan 2019,06:23PM at 6:23 PM and is filed under Africa, Homepage Featured Story Slider. You can follow any responses to this entry through the RSS 2.0 feed. Both comments and pings are currently closed.